If you need to order AVCS or ARCS charts then the easiest way is to use the Admiralty Digital Catalog (ADC) to select the required cells/Charts, creat a basket and email it to sales@euronav.co.uk. The Admiralty Digital Catalogue (ADC) allows you to easily select required AVCS (ENC) cells either by area or by inputting a route. Select AVCS on the bottom bar. 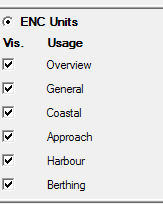 Select ENC units - Tick all boxes. You can also mix the two methods to add port of refuge etc.